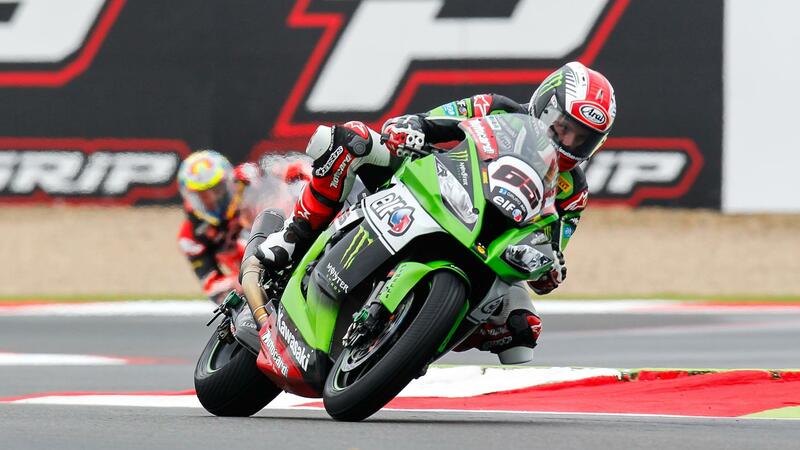 Jonathan Rea (Kawasaki Racing Team) overhauled long-time race leader Tom Sykes (Kawasaki Racing Team) to record the first race win, in a shortened 19-lap WorldSBK race at Magny-Cours. An oil spill on the track in morning warm-up had brought about a long delay to clean up the mess, and the race got underway 15 minutes late. In passing Sykes, with a hard move on the inside at the 180 long hairpin, Rea used his superior pace on wet tyres on a drying track to win, with Sykes finally 4.711 seconds back, in second place. Fourteen seconds behind Rea, Sylvain Guintoli (Pata Honda WSB) took third place for his first podium of 2015, celebrating with a huge burnout in front of his adoring fans. 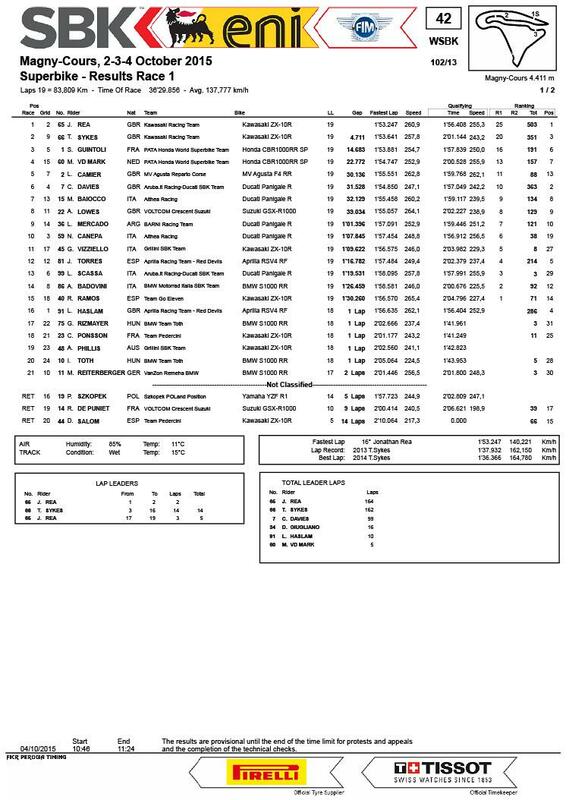 His team-mate Michael van der Mark (Pata Honda WSB) placed fourth, and a strong fifth came for Leon Camier (MV Agusta Reparto Corse) who had moved up and run wide through the race, finally taking his best result of the year. Chaz Davies (Aruba.it Racing - Ducati WSB) lost ground to Sykes in the battle for second place overall, finishing sixth in race one, and Ducati privateer Matteo Baiocco (Althea Racing Ducati) was seventh. Alex Lowes (Voltcom Crescent Suzuki) placed eighth on a day when his team-mate Randy De Puniet (Voltcom Crescent Suzuki) retired and on another good day for Ducati privateers Leandro Mercado (Barni Racing Team Ducati) and Niccolo Canepa (Althea Racing Ducati) rounded out the top ten. Pole man Leon Haslam (Aprilia Racing Team - Red Devils) had a nightmare race, finishing 16th after stopping to change from his wet tyres to intermediates.